Millie (left) is a four-year-old Shih Tzu / Bichon mix gets over excited when she hears the doorbell. 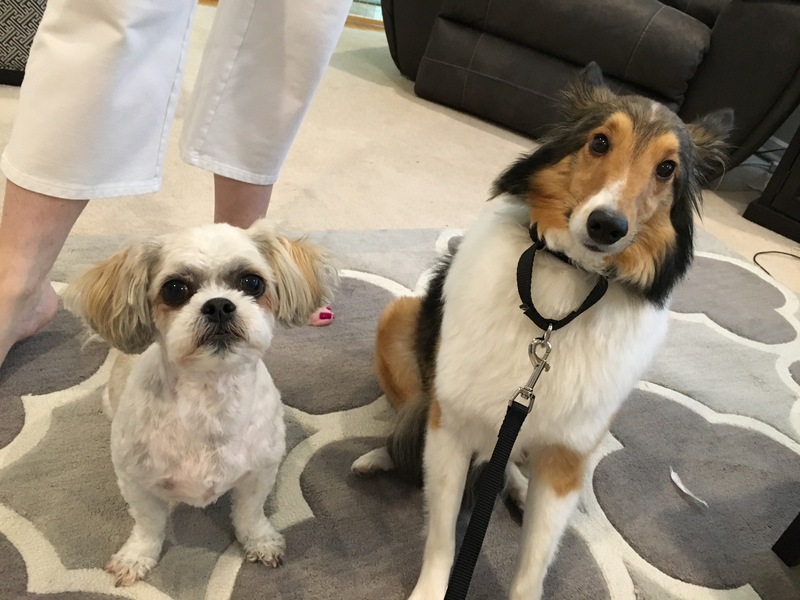 Her room mate Bentley is a very fearful three-year-old Sheltie who is not a fan of strangers. He also shuts down when his guardians try to take him out for a walk. I started off the session by sitting down with the dog’s guardians to get a feel for the discipline and structure they incorporated into the dog’s daily lives. Because the guardians did not have any rules and allowed the dogs to tell them what to do, Bentley and Millie got the impression that they had the same authority as the humans they live with. If a dog considers you it’s equal, then it only has to listen to you if it wants to. In order for Millie to stop challenging and for Bentley to regain his confidence, the dogs guardians will need to assume the leadership role in the dog’s eyes. Introducing rules and structure, following through consistently and correcting the dogs whenever they break these rules will help the guardians change the leader follower dynamic. This is important as the dogs see us through their eyes, not how we want them to see us. I also wanted to show the guardians how they can do some dog training using positive reinforcement to motivate their dog so I went over a few simple exercises. I started out by teaching the dogs to use a dog bed and rewarding them each time they got on it. I held Millie back the first few times as I knew Bentley wasn’t going to try to get to the reward first or take it in front of her. Bentley clearly considered himself subordinate to Millie. Next I showed the guardians how they can start using my Petting with a purpose technique to motivate the dogs to start engaging in the actions or behaviors the humans wanted. It’s going to take the guardians a couple of days to get into a habit of only petting their dog when it does something for them first. But once they do, they will engage in a mini dog obedience training session without even thinking about it every time they pet their dog for the rest of its life. I also showed the guardians how they can use different communication methods to disagree with the dogs anytime they started to break any of these new rules. Shortly after giving my first minor correction, Bentley showed how low his confidence level was by leaving the area altogether. When I discussed the situation with his guardians, I learned that they were actually (unintentionally) reinforcing some of Bentley’s behavior by petting him when he was nervous. When you pet a dog when its nervous, you are nurturing the dog’s unbalanced mind. Thats also when I learned how much they struggled to take him outside for a walk. He would try to simply shut down and crawl up into a little ball each time they put the leash on him. I planned on doing a short video that showed how his guardians could use the leash to get him to stop shutting down inside of the house. What we ended up filming was probably the best 10 minutes I have ever given on how to help a fearful dog learn to stop living in fear. Once we got outside, Bentley’s disposition changed quite a bit. At first he was a little bit cautious, but within minutes his head was high, he had a bounce to his step and his tail was starting to rise. I suggested that his guardians take him out for a short walk like this anytime he starts to get anxious, nervous or shuts down in the house. Even if the walk is only halfway down the street, the changing of environment and forward movement will help Bentley learn to stop shutting down. Millie on the other hand, was a bit of a mess on the walk. Her guardians told me that she pulled them all over the place and paid almost 0 attention to them. I spent the next few moments over some basic leash training in today’s Dog Gone Problem dog school, LOL. This makes two sessions in a row where I worked with a pair of dogs who had diametrically opposing behavior problems. Millie needs to learn to respect the humans that she lives with as her authority figures. Once she does, she will stop challenging them and respect the guardians when they correct or disagree with her. Bentley needs to know that his guardians have assumed the leadership role so that he no longer feels obligated to do so on his own. Once he identifies as being in a follower position, a great deal of stress and anxiety will be lifted which will allow him to learn to relax and simply be a dog again.